A popular German website, specialising in a wide variety of flights, attractions, tours & vehicle hire in Australia. Award-winning flexible touring holidays to Australia, New Zealand, South Africa & India. Enjoy a self drive holiday like no other… Discover car hire, motorhome and campervan hire in Australia, New Zealand and the USA. Connecting local RV owners to travellers worldwide. The world’s largest travel site, enabling travellers to plan and have the perfect holiday. As one of the largest tour companies, G Adventures offers comfort, active, yolo, marine, family, adventure, local, rail and private tours all over the world. The Northern Territory Convention Bureau (NTCB) is your key to unlocking a successful business event in the NT. Focuses on tours, fishing, accommodation and car hire within the Northern Territory. TCA is a non-profit, incorporated association of businesses, individuals and organisations committed to the growth of business and tourism in Central Australia. Official tourist information provider for the “Top End” region. We invite everyone to come join us in Alice Springs in 2018! The World Travel Guide (WTG) is the flagship digital consumer brand within the Columbus Travel Media portfolio. Australia’s leading car rental comparison website. They make comparing and booking a car hire easy. It is free to book and you are assured of getting the lowest price. 4WD & Car Rentals: Britz Rentals is the largest specialised leisure vehicle operator in Australasia. New Zealand & Australia: A Maui Motorhome, offers transport and accommodation all in one. The Rock Tour is the first choice for budget conscious travellers and International Backpackers looking for a high quality tour at an affordable price. Australia’s favourite guided holiday company, with over 100 years of experience. Their wide range of Day Tours, Short Breaks and Guided Holidays are the perfect way to experience the best of Australia & New Zealand. Kavanagh Balloons is Australia’s only manufacturer of hot air balloons. Since 1979 we have been designing, constructing and certifying balloons for sports, private and commercial use. We’ve been providing thrilling hot air balloon rides throughout the UK for more than 20 years. If you would like us to place your link here you must have a Tourism based website and be willing to include a link on your website to us. We reserve the right to refuse placing your website on our list. Please contact us if you fit the criteria. The links that appear on this page relate to third party sites, Outback Ballooning is not responsible for and makes no representations concerning the condition and content of, or products offered at the third party site. 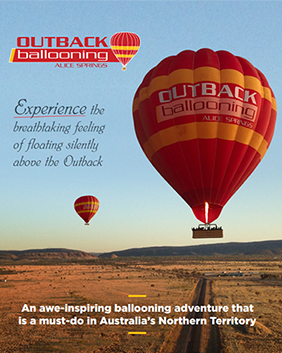 The link does not indicate, expressly or impliedly, that Outback Ballooning endorses the site or the products or services offered there. You access the site and use any products or services at your own risk.